How Many Acres Is Golden Gate Park? Enjoy the Bay Area's outdoor spaces. The San Francisco Bay Area outdoors has an amazing array of hiking and camping options that are just waiting for you to explore them. Whether you're interested in picnicking at the beach, mountain biking in the Oakland hills, or camping for a week at Big Sur, the Bay Area provides countless ways for locals and visitors to get outside into the fresh air and enjoy all that the San Francisco area has to offer. 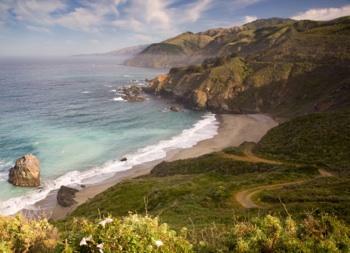 If you love to walk in the outdoors, the Bay Area has an endless number of hiking trails. Explore the nooks and crannies of Muir Woods while the branches of ancient redwood trees filter sunlight onto the forest floor. If you have a dog, there are many bay area dog hikes where both you and your pooch are welcome to peruse the plants and wildlife. The San Francisco Bay Area outdoors has many camping options if you prefer to take your excursion overnight. With literally hundreds of square miles of open space scattered throughout the area, you won't need to travel far to find the perfect place to pitch a tent or park your RV! Consider the Marin Headlands Campground if you want to check out the finer points of Marin County or Big Sur if the Santa Cruz Mountains' coastal views are more up your alley. With all that it has to offer, you'll never get bored with the San Francisco Bay Area outdoors.